Chocolate Indulgence Basket. 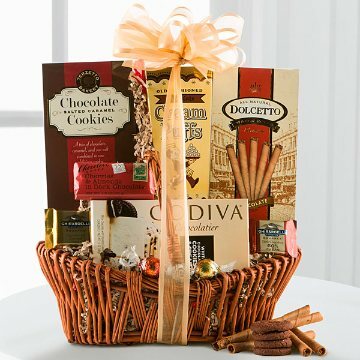 A basket overflowing with chocolate in such amounts that your special lady will be overwhelmed with her choice of indulgences! This chocolate lover's dream come true includes Dolcetto wafer rolls, Chocolate Chip Cookies, and much more! This gift includes the following: Dolcetto Wafer Rolls 4.4-oz., Godiva White Chocolate Cookies & Cream Bar 3.5-oz., Chocolate Creme Puffs .77oz, Chocolate Salted Caramel Cookies 2-oz, Cherries & Almond in Dark Chocolate Chocolove Mini Bar 1.3-oz., Ghirardelli Dark Chocolate Square .375-oz., Ghirardelli Milk Chocolate with Caramel Square .375-oz., Lindt Ball Milk Chocolate, Lindt Ball White Chocolate.